Take a good look at this little black box. It may not look like much but it’s the future of cord-cutting. 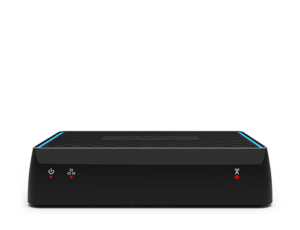 It’s the AirTV, and while the name may sound familiar, this is a completely different box. You’ve seen the box above. It’s the AirTV Player and it’s the perfect solution for cord-cutters who want to add an antenna. But, as good as the player is, it’s designed to be attached to a TV. Let’s be honest: you don’t just sit in the living room anymore. You watch videos anywhere and everywhere. The AirTV Player is the solution you want for one room, but what about the rest of the world? You can watch YOUR local channels ANYWHERE you have an internet connection. If you’re at home, watch on your TV using the free AirTV or Sling apps on a streaming box or smart TV. On the go? Use the AirTV or Sling apps on your phone or tablet. It doesn’t matter where you are as long as you have cell service. You can be watching TV… YOUR TV… with nothing else to pay, nothing else to buy. This box lets you connect your antenna anywhere there’s Wi-Fi or wired internet and distribute it throughout your house with no additional wiring. Just use streaming boxes at every television. You’ll get local channels everywhere in the house, everywhere in the neighborhood, just everywhere. You don’t have to worry about running extra coax lines or dealing with multiple devices. Up to two devices can work with the AirTV at the same time, no matter whether they’re in the house or out in the world. What really impresses me here is the potential for RVers. For years, we’ve sold antennas to RV customers and they work well when the RV isn’t moving but they don’t work at all when it’s on the road. This is just a limitation of the broadcast system. With this device, you don’t need an antenna on your RV and you’ll always get your local channels from home, which can be a big plus when you’re on the road. Let’s dig into some of the details. Is there a monthly cost for AirTV? There is NOT a monthly cost. It’s all free. If you don’t have an unlimited data plan you’ll pay for data, so contact the folks at Signal Connect at 866.726.4182 and upgrade to unlimited. How many people can use AirTV at the same time? Two devices can use the system at the same time. You can add multiple devices if you need more than that. How do you watch your local channels? There are a pair of free apps. The AirTV app is completely standalone and lets you have your locals on your phone or streaming device. The Sling app integrates your local channels with a Sling subscription if you want to build a cord-cutting solution. You can choose either app and if you want to switch to the other, you can reset the box and set it up with the other app. AirTV setup is done with their the AirTV or Sling app on your phone. Once you’ve done that you can add the app to your streaming device. There is a simple, two-tuner DVR built into the device. You add your own USB hard drive and it “just works.” If you’re familiar with the DVR functions already in the Sling app, it’s basically like that. Can I use AirTV to watch shows in another time zone? If you own houses in two time zones you can connect an AirTV in one and watch it in the other. It’s not intended to let you watch someone else’s shows. How is this different from Tablo, HDHomeRun, and other products that say they do the same thing? AirTV has easier setup, more flexibility, and doesn’t require an expensive app. It also is the only system that integrates with Sling for an experience that’s very much like a traditional pay-TV setup. Does AirTV work with my streaming setup? The AirTV app works with TvOS (AppleTV) and Roku devices. The Sling app only works with Roku for now but TvOS is coming. Both apps work on iPhone and Android. Where can I get AirTV? AirTV is available now at Solid Signal.